Enchanted forest - Monsieur T.
Your focus is drifting towards the fridge? A cup of Forêt enchantée will keep you focused on tha task at hand. Like finishing your book / homework / reports / house clean up. In the Enchanted Forest, there’s a host of magical creatures with mysterious powers. It’s no coincidence that this brew allows you to fill up on energy. It’s composed of tea and green mate, coconut, rose petals and blueberry flowers with stimulating properties. Its aroma evokes that of a rich black-forest cake. 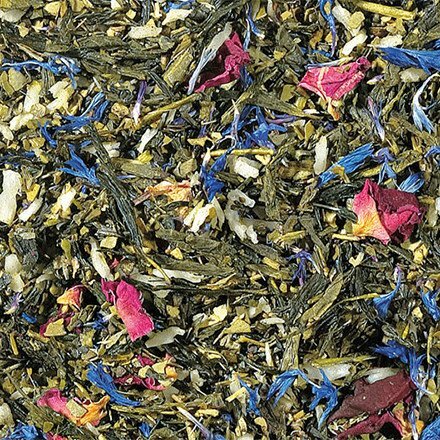 Contains: Green mate, Chinese Sencha green tea, coconut, flavors, rose petals, cornflower flowers.